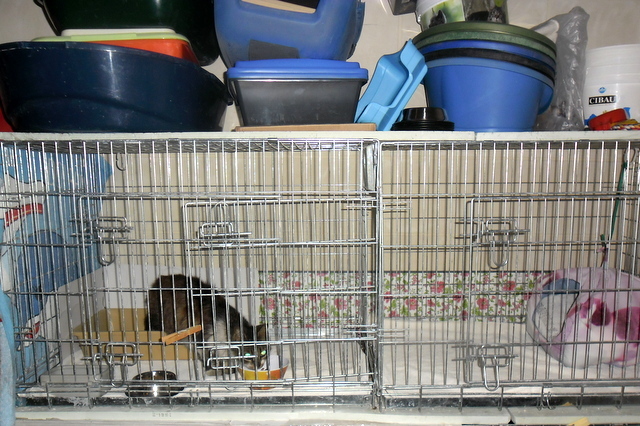 Filomena and the 3 kittens were taken to the vet. 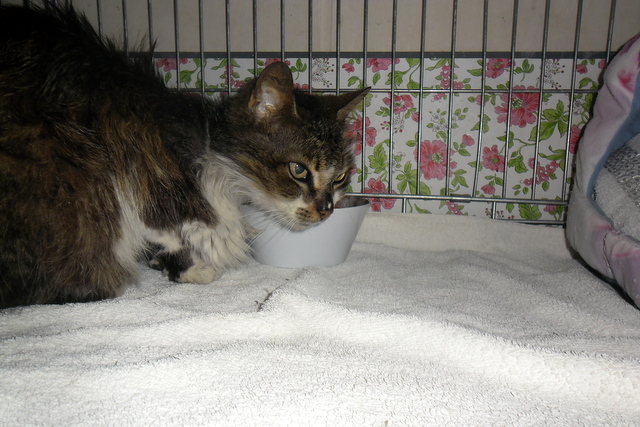 Filomena is recovering well but has gingivitis. She had some injections and medication. The 3 kittens are doing well but the small Tal-Madonna is a BIG worry! The vet cut one of her eyes to let the pus out and this relieved her a bit. 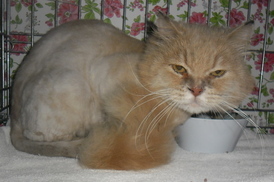 We found a lovely fosterer for the Semi Persian and a lovely lady who's going to adopt him in 4 weeks time! very sad in a cage and is waiting for a FOREVER home! 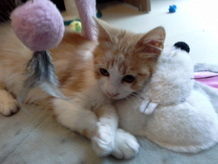 Snug, a 4 months old kitten, was found abandoned. He's being fostered and we're trying to find the best home for him. Three abandoned kittens were found. They are about 2-3 weeks old and their eyes are infected. We are taking care of them and are doing everything to make them healthy again: they are bottle-fed, their eyes are cleaned several times a day and we're giving them antibiotics. We had a meeting with Roderick Galdes, the Parliamentary Secretary for Agriculture, Fisheries and Animal Rights on behalf of FARM (Federation for Animal Rights Malta). We have high hopes that things will change for the better with the new government! Late afternoon we got the results of the bloodtests of George and Filomena. 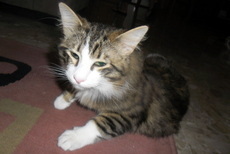 George was already deteriorating during the day and the test showed that he had FeLV. R.I.P. dear George, we loved you so much and you'll be always in our hearts. At least the test results for Filomena were good! The results for FIV and FeLV were negative and nothing is wrong with her liver and kidneys. She's only starved and traumatised so we hope that with good food and a lot of loving, tender care she'll recover completely! The vet made a home-visit. She examined Muchka, who's going to Germany tomorrow, and prepared her passport. George and Filomena (the rescued cat of last Sunday) were examined also. 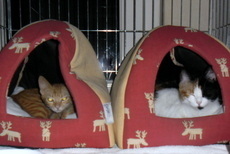 Their blood was taken for FIV/FeLV and kidney/liver tests. A report was filed to the police. Hopefully we'll find a lawyer who's willing to help us for free so we can take this case to court. This is very serious and we hope to make a statement (and set an example) that this kind of bullying is not accepted in Malta anymore! A female was found skin and bones. We took her to the vet and is in our recovery. The whole "conversation" was recorded on a mobile-phone and tomorrow she's going to report to the police. If you can give them a FOREVER home, please contact us! 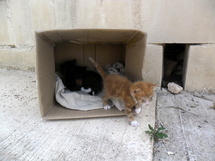 One of our volunteers who's feeding the cats in Etna Road (Mellieha) every day was attacked by a very agressive woman. She pushed our volunteer, sprayed the cats with a cat-repellant, put pooh in the water-bowls and said that she was going to poison all the cats! We're taking this very serious and are going to report her to the police. Maya and Pippa were neutered. Bro was taken to the vet for another X-ray. There's still pus in the bones but it came less; it seems the bones are calcificating and fighthing the infection. Another 4 weeks on antibiotics! Is this ever gonna end?! He's on antibiotics for such a long time and we are far from happy with this!